Fight Baldness + Two Other Reasons To Put Castor Oil In Your Hair Right Now! Coconut oil and olive oil are the two most prominent oils that most people reach for when trying to improve their body, hair and skin, but did you know castor oil has many enriching properties that can strengthen your hair and promote growth? Castor oil is made from the seeds of the Ricinus communis plant. Castor oil is well known for an array of health benefits, especially for its rejuvenating effect. In fact, the mild smelling oil has been used throughout history to strengthen hair while giving it luster and shine. Many people apply castor oil regularly to their scalp to encourage hair growth and prevent hair thinning or hair loss. Whether you’re familiar with castor oil or have never heard of it, keep reading to discover why castor oil could become your new favorite oil this year. With so many things to worry about in this world, stress can cause hair loss, which is ironic because most people feel even more stressed after witnessing hair loss! When men develop male baldness, it typically causes a receding hairline around the crown area of the head. Male pattern baldness is the cause of 95 percent of hair loss in men. By the age of 35, at least two-thirds of American men will experience hair loss. And by the age of 50, approximately 85 percent of men have significantly thinning hair, according to the American Hair Loss Association. Improper hair care, stress, hormonal imbalances, genetics, aging, nutritional deficiencies and overuse of chemical-based hair products can all weaken and shrink the hair follicles. This eventually results in thinning hair strands and baldness. Studies show that balding men have higher levels of PGD2 on their scalps than men who aren’t balding. Research has also found that ricinoleic acid can inhibit PGD2 for men. This is where castor oil comes in; it contains ricinoleic acid and thus can be a catalyst for hair regeneration and growth. In addition, proper blood scalp circulation is essential for promoting hair growth. 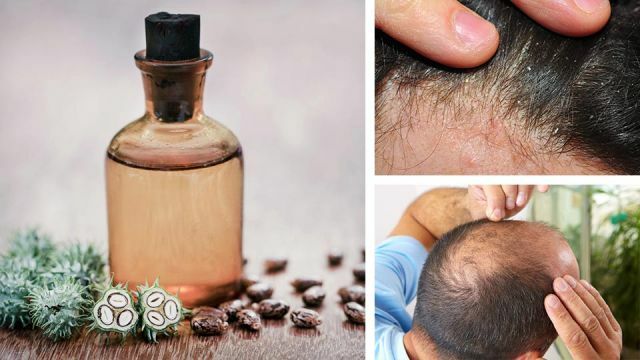 Since castor oil is rich in ricinoleic acid, applying and massaging castor oil directly into the scalp can help improve circulation and blood flow. By the age of 50, approximately 50 percent of women will experience female pattern hair loss, according to American Hair Research Society. In addition, alopecia is a hair loss condition most commonly seen in women. Common reasons for alopecia range from nutritional deficiencies to acute distress syndrome. Many women also experience alopecia as a side effect of certain medications. There are various types of alopecia such as alopecia areata, scarring alopecia and anagen effluvium. Castor oil is fawned over because its plentiful amounts of ricinoleic acid, as mentioned above. Ricinoleic acid, an omega-9 fatty acid, has been shown to have anti-inflammatory effects. Around 89.5 percent of castor oil is made up of a fatty acid composition of ricinoleic acid, which can effectively reverse hair loss. Castor oil is also antimicrobial and can help prevent hair loss that is caused due to inflammation, fungal infections or bacterial infections. Dandruff can be embarrassing and stubborn to get rid of. The cause of dandruff is debatable, but malassezia fungi has been the suspected cause of dandruff for more than a century. And if you have dandruff, it may also cause thinning hair. In fact, during a study by the The American Journal of Clinical Dermatology, hair shedding was prominent in the study participants who had higher levels of dandruff. So what’s the solution? Well, castor oil is packed with nutrients such as minerals, omega-6 fatty acids and vitamin E, all of which help moisturize dry dandruff flakes and fight a pesky, itchy scalp. In addition, the rich fatty acid content of castor oil makes it perfect for massaging into your scalp to keep it healthy and moisturized. No one likes split ends; they make hair look dull and lifeless. Castor oil can mend split ends because the fatty acid content nourishes hair while giving it a glowing shine. It has great moisturizing properties that hydrate and nourish the scalp to prevent dry, itchy and frizzy hair. The conditioning agents within the oil can repair split ends and breakage. Olive oil and castor oil can also be used together to soothe inflammation and moisturize the scalp. Slightly warming the oil before applying it to your scalp can improve blood circulation even more, just make sure it’s not hot! Castor oil can be left on overnight or applied to hair about 20 minutes before shampooing as a moisturizing pre-poo. Have you ever used castor oil for hair growth? Let us know in the comments below! Hey Buddy!, I found this information for you: "Fight Baldness + 2 Other Reasons To Use Castor Oil On Your Hair". Here is the website link: https://www.thealternativedaily.com/3-reasons-to-use-castor-oil-on-your-hair/. Thank you.